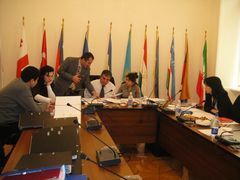 In compliance with the Agreement on Joint Financing of the Permanent Secretariat of the IGC TRACECA between Governments of the Parties to the MLA on International Transport for Development of the Europe-the Caucasus-Asia Corridor” of 21.04.2005, Interim Regulations of the Auditing Team of the PS IGC TRACECA of 03.05.2006 and Final Resolutions of the Eighth Annual Meeting of the IGC TRACECA of 13.10.2010, there was hold an Audit for the control of the budget execution of the PS IGC TRACECA for 2010. 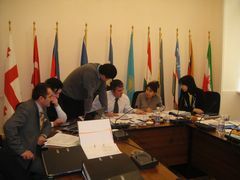 The audit team was provided with representatives of the Kyrgyz Republic, Romania and the Republic of Tajikistan. 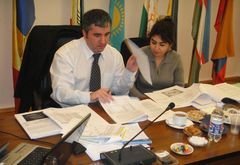 According to the results of the audit was signed Annual report, prepared in accordance with the requirements of the regulations of the audit team of the PS IGC TRACECA. This document will be submitted to the next meeting of the TRACECA Intergovernmental Commission.